Today is my thirteenth wedding anniversary. To celebrate, my wife and... Oh wait, no. To celebrate, my wife went by herself to New York City for a long weekend to visit one of her friends! I guess that was my gift? Back on this day in 1997, I left work early and picked up my (shortly-to-be) wife and headed over to White Plains City Court. After waiting in the lobby for about ten minutes, a bailiff came out and led us and a coworker (our witness) into the court. The judge was standing up front, introduced herself, said that this is one of the nicest things that she does in court, and then married us. It was funny as the bailiff also doubled as photographer! We were back outside in less than 15 minutes. So I called my wife this morning and left a voice mail on her cell phone, wishing her a Happy Anniversary. Before she listened to the message, she called to say hello as she and her friend were leaving to Manhattan this afternoon. It was apparent that she didn't hear the message or remember it was our anniversary. So when it was time to hang up, I told her I had left the message and Happy Anniversary (by the way). She said she thought it was tomorrow! Can you believe that? 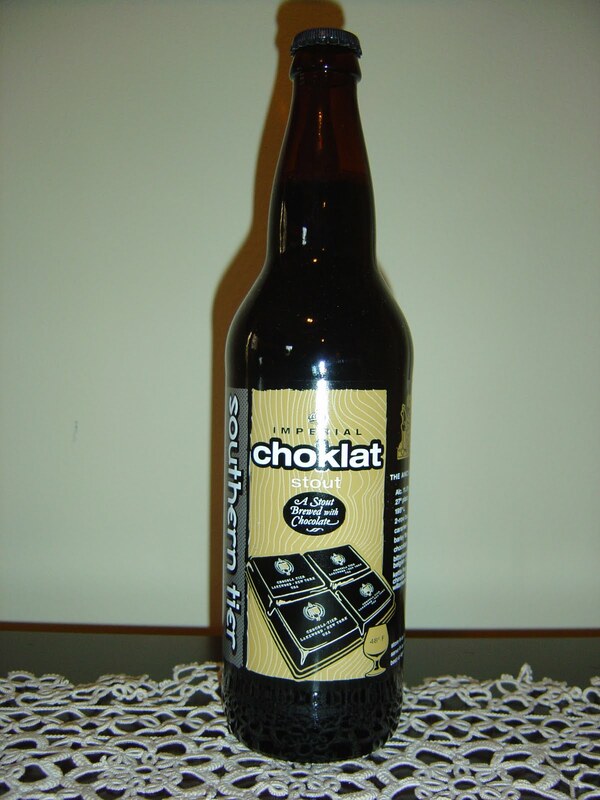 Today I am celebrating with a big 22 ounce bottle of Choklat Imperial Stout brewed by Southern Tier Brewing Company in Lakewood, New York. I was looking back a few minutes ago to see what I wrote last anniversary. It seems that I have a thing for celebrating with stouts: Bell's Special Double Cream Stout. Choklat is part of Southern Tier's Blackwater Series. The bottle talks about Mayans and their sacred book call Popol Vuh and their love of chocolate. It also says I should serve this at 48 degrees F in a snifter. Rich cocoa, milk chocolate and Whoppers aroma. The flavors are chocolate and more chocolate and then more chocolate. Luxurious! There is definitely a malted milk ball Whopperesque flavor to this beer. Besides chocolate, there are hints of coffee and vanilla, but there is no mistaking the star of this guy. Very creamy and smooth. The 11% alcohol is a very nice component, warming with every sip, giving a small burn, and cutting the intense rich sweetness. 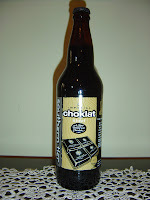 Choklat is mostly balanced--on the sweeter side but not too sweet. Low to medium carbonation is fine. It takes a special person to love chocolate this much, but I might just be that person. I really liked this beer! Quite a treat! I'm glad you liked it. This is my favorite chocolate stout out there. Also can't believe your wife pulled one of the oldest excuses in the book on you. Yeah, Mike. Really good. I'm glad it landed on the sweet side, too, but not too sweet. all this talk about chocolate stouts is making me have to Popol. hehe. Lately I've been developing a taste for Russian imperial stouts. I can only take the chocolates in small doses though. I made a chocolate stout cake out of this beer and it was awesome! Hi Tania. Thanks for stopping by. That sounds pretty awesome! Do you have a picture or a recipe that you'd like to share? And it's past lunch time too. I'm hungry.